Islamists on the March in Somalia? Within the last week the United States Launched an Air Strike in Somalia. Meanwhile the Insurgents have gained control over two towns. What will happen next? After a recent lull Tensions are again rising within Somalia. Within a span of 24 hours hours Islamist Militias captured two strategic towns. The towns Hudur and Belet Weyene are stategically important. The town of Belet Weyene just happens to be on the Main Supply Route for Ethiopian Troops. While the Offensive is going on the US has targeted an Individual who is believed to have played a role in the Attacks on the US Embassies in Nairobi and Dar Es Salaam back in 1998. The Islamists have threatened to launch an Iraqi style Insurgency since they were driven from Power in December 2006. 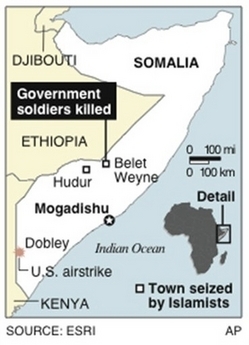 This map shows the location of the US Airstrike and the Towns that have been targeted by the Insurgents in Somalia. The situation within Somalia can best be described as a powderkeg. Their are several well Armed Factions in the Country. Small Arms are easily obtained. The Centralized Government has little power outside the Capital of Mogadishu. Although there is a Heavy Ethiopian Presence in the Country there has been approval for a Peace Keeping Mission. So far only Uganda and Burundi have sent troops to take part. The US has a command set up for any Contingency. The Combined Joint Task Force Horn of Africa (CTJF-HOA) has a base in the region and is currently conducting Operations in the Area. This may be an issue that needs further scrutiny.